Diving into the centre of the Earth almost killed Andrew Wight - but it also opened a new world of opportunity. The desolate expanse of limestone that is the Nullarbor Plain seems to stretch forever, a dry, treeless desert under a relentless sun. But beneath the surface lies water - and one of the longest, deepest underwater cave systems in the world. 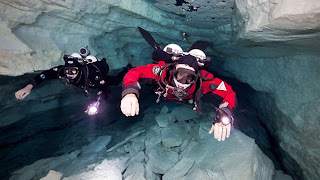 For cave divers the Pannikin Plains system, up to 3.5km below ground, is so challenging it is has been likened to scaling Everest. But cave diver Andrew Wight, about 500m in, was feeling pretty satisfied. It was the final day of a month-long expedition and Wight and the rest of the 15-member group had pushed themselves to the limit to explore this subterranean world - diving so deep they had run right off the end of the known decompression tables. The doctors had warned it was virtually certain one of the divers would be killed or get "the bends" so badly they would suffer for life. But the team had defied the doomsayers. Certainly there were risks when diving so deep and in such isolation, but there were rewards too: massive underwater cathedrals, beautiful limestone rock formations, all waiting to be revealed for the first time in the light of their torches. But you cannot plan for everything. Nature can always throw up something unexpected. And unknown to Wight, up on the surface the wind had begun to pick up. A storm was building over the desert, and soon the gusts were hitting 100km/h as the freak conditions dumped two years' worth of rain and hail the size of golf balls on the plain. And then, like bathwater into a plughole, the deluge found the entrance to the caves. The earth began to shift, rocks to move, and a landslide buried the cave neck under hundreds of tonnes of rubble. Two divers got out, leaving 13 in danger of being entombed 100m underground as the floodwaters began to rise. Twenty three years later the events of that day have inspired a new 3-D film overseen by Avatar director James Cameron. Wight is now a successful movie producer who co-wrote and produced the movie Sanctum, inspired by that ill-fated 1988 expedition. Wight tells saweekend how he found himself with another diver, Vicky Bonwick, perched precariously on a ledge the size of a small kitchen table. They watched in horror as the roof began nudging down. "The inner workings of the cave had rearranged themselves," he says. "We were stuck between the raging water and an ever-diminishing space between the roof and us." They faced a difficult decision: stay put and hope the roof wouldn't cave in before rescue arrived, or make a break for freedom. The only way back out was to climb a rope through the jumble of rocks blocking the entrance - with the very real chance they could be crushed by rocks shifting as the water flooded in. After five hours Wight decided to take his chances. "Vicky was catatonic, accepting our fate," he says. "I was more resistant and finally said: 'We're going to have to do something.' Running for it, with the risk of being skittled by a boulder, is a better option than letting the roof come down on our heads." They swam, climbed and wriggled free to safety. Then Wight helped to lead the rescue team that managed to locate and extract the rest of the expedition after 27 gruelling hours. In one of those curious twists of fate that come to define a person's life, Wight had arranged for a cameraman to document the Pannikin Plain expedition. Working for an agricultural company at the time, he had no intention of becoming a filmmaker. He simply thought they could help cover the high costs of the expedition by selling the documentary. The resulting footage of the collapse and dramatic rescue turned into a gripping documentary called Nullarbor Dreaming. Its success led Wight to become a film and television producer, specialising in nature and ocean documentaries. He wound up collaborating with Cameron on his 3D ocean documentaries Ghosts of the Abyss and Aliens of the Deep, and their friendship eventually led to Sanctum. Cameron's name on the poster ensured the Australian film, starring Richard Roxburgh and Rhys Wakefield, attracted international attention. It will be released on more than 7000 screens worldwide. "The film and the real events track pretty well until the point of entrapment, and in the movie they decide to explore their way out," Wight says. "In the real story we got out happy and alive. Sanctum explores a much darker outcome." The movie shines a light on a sporting subculture few people are familiar with, and even fewer people pursue. Across Australia there are just 800 accredited divers risking their lives to explore a beautiful underground world that's as alien to most of us as the outer reaches of space. 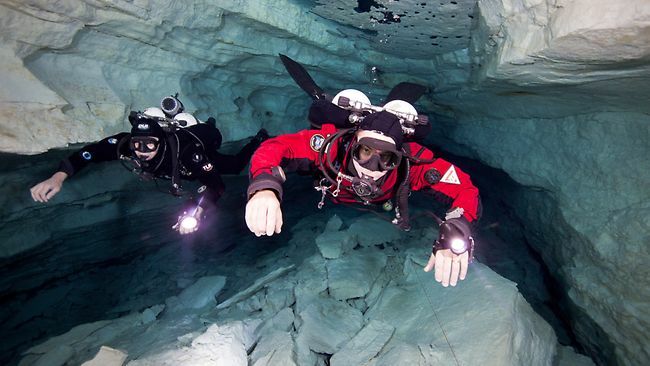 It's a sport that combines the traditional Scuba-diving threat of drowning with the added danger of getting trapped or lost in caves deep underground. And then suffocating. Christies Beach cave diving instructor Peter Costello is used to getting funny looks when he tells people at parties what he does. "They all say: you're mad," he says. "Most people say: 'I could never do that'." But there's a pay-off for the danger. "You get 'restriction' areas, but then you swim through to a massive big opening and it's just brilliant seeing stuff like that," Costello says. "The drawcard is definitely going somewhere no one has ever been before." Apart from the Nullarbor cave system, which is near Cocklebiddy just across the border in Western Australia, there are a number of other cave diving sites around the country including in New South Wales and Tasmania. But the jewel in the crown is the lower southeast of SA around Mt Gambier, which boasts some of the best cave diving sites in the world. There are more than 330 known caverns, sink holes and caves with ominous names like The Black Hole and Death Cave. One of the most spectacular is Tank Cave - a labyrinth of more than 10km of interconnecting passages, with new areas still being discovered today. It even has an open underground chamber called "Lake Air". Another famous Mt Gambier site is The Shaft. On the surface it's just a hole a metre in diameter in the middle of a paddock. But 7m below the earth's surface the hole opens up into a huge underground chamber with a lake spanning 100m. Most of Sanctum was filmed in a huge studio tank on the Gold Coast, but a film crew came to Mt Gambier to capture additional footage. Wight is familiar with all of the Mt Gambier sites, having grown up in the nearby Victorian town of Harrow. In his teens and early 20s he spent most weekends diving in these caves. "There are only a couple of places in the world which are easily accessible and have clear water," he says. "A lot of them require you to go for miles in an underground cave system before you even get to the water. But in Mt Gambier and Florida you can basically drive up to a sink hole and just jump straight in." The first cave dives here took place in the late 1950s. In the early days ocean divers would blunder about the underground systems using a single tank of gas and home¬¬made underwater torches. The peculiar risks of cave diving meant tragedy was almost inevitable. Between 1969 and 1973 11 divers died in these under¬water caves, leading to the formation of the Cave Diving Association of Australia. It implemented strict safety and training procedures and has since certified 4500 divers. If you don't have a ticket from the CDAA, you don't dive in SA caves. Wight says the basic rules of cave diving developed through a high-stakes process of trial and error. "The rules slowly evolved, etched in the headstones of those who didn't make it," he says. The golden rule is to always bring a spare air supply in case something goes wrong with the primary one. After all, there's no quick ascent to the surface when you're in a cave. "If you're a diver with a single tank and a single regulator and something fails you're going to die," he says. Another problem cave divers discovered early on was vision difficulties. While Mt Gambier might be famed for its crystal-clear water, the merest touch on the wall of a cave can cause a "silt out", reducing visibility to zero and causing a diver to become lost. So divers always reel out a guide line to allow them to return to safety even when they can't see. Regularly visited caves have permanent guide lines installed. Divers also carry two extra torches in case the primary one fails, and operate their gas tanks with a rule of "thirds". That means you use a third of your air to get in to a cave, a third to get out, with a third left for emergencies. Costello says the dangers of cave diving are repeatedly drummed into learners - which can make novice divers more than a little anxious. "The first couple of sink holes I did were a bit scary," he says. "They were big and dark and you've got the training you've done fresh in your mind and they really emphasise the dangers and what can go wrong. But as you get more experienced it becomes easier - but you can never get complacent." While there has only been one cave diving fatality in Mt Gambier in 30 years, it occurred in March last year, when a highly experienced 52-year-old diver drowned at Kilsby's Sinkhole. The coroner is yet to determine exactly what happened but reports suggest he may have become entangled in a guide line or had an underlying medical condition. The death demonstrates that no matter how good the training and equipment, cave diving is an inherently dangerous activity. But despite the hazards, enthusiasts say it's not an extreme sport undertaken for thrills. "You don't get a lot of adrenalin - panic is the only thrill you're going to get," says Costello. "Most of the time it's nice and relaxed. Every now and then you do get a bit freaked out, but your training is to not panic. You've got to keep your head together and get through it." Sanctum director Alister Grierson became good friends with many cave divers during the two years he spent making the film. He playfully describes Wight as "mad as a hatter", but says most divers aren't reckless. He says they sensibly manage the risks they need to in order to see things most people never will. "Some people will just shrug their shoulders and go: well good on you, you've seen a hole in the ground no one has ever seen before," he says. "But to others it's the equivalent of scaling Mt Everest."